I was 6 weeks when i went in to get my sonogram to check dates.They did the trans vaginal aultrasound, When they were searching it took her a while to find the sac and then an even longer time to find the baby...we finally seen heartbeat and everything..the baby was just hiding! We were just so excited to see the baby she didnt even look for anything else.I did take chlomid to get pregnant and when I got home I noticed what looked like two sacs..could it be a twin? It deff. looks like it to me. Comments for 6 Weeks With Twins? 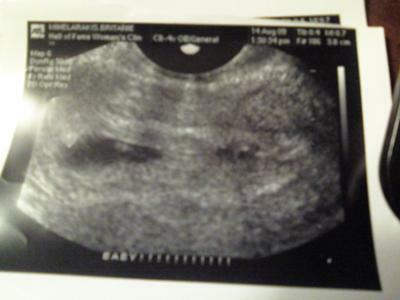 It was only one boy at my aultrasound....They said if it were a twin ...it may have absorbed.. :( But I am having a healthy boy! Thank you ...My next appt. is sept. 23rd...He should schedule another one then...we will c!! Waiting to hear the news? Is it twins? I am crossing my fingers for you! Yea, I def think this is twins!!!! Congrats! Let us know if it is or not!